There will be two more opportunities to complete your Volunteer registrations as required by the Archdiocese of Brisbane. Everyone from Collectors and singers, to readers and gardeners are required to complete some paperwork. If you are a current volunteer or considering joining in, then please come along. ARE YOU OR SOMEONE YOU KNOW CELEBRATING A SPECIAL ANNIVERSARY? On Sunday 24th June we will celebrating as part of the 9am Mass at Laidley with all those couples who have their 10th, 25th, 40th, 50th, 60th or 70th wedding anniversary in 2018. There are couples celebrating their 50th and 70th anniversaries - how very exciting! 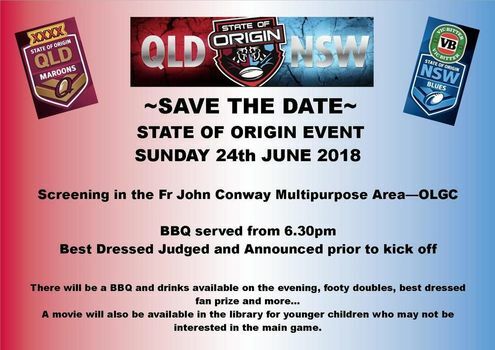 OLGC and Our Lady of the Valley parish are coming together for a BBQ and fun evening, including screening of the game in the Fr John Conway Multipurpose area.